Lighthouse of Alexandria. 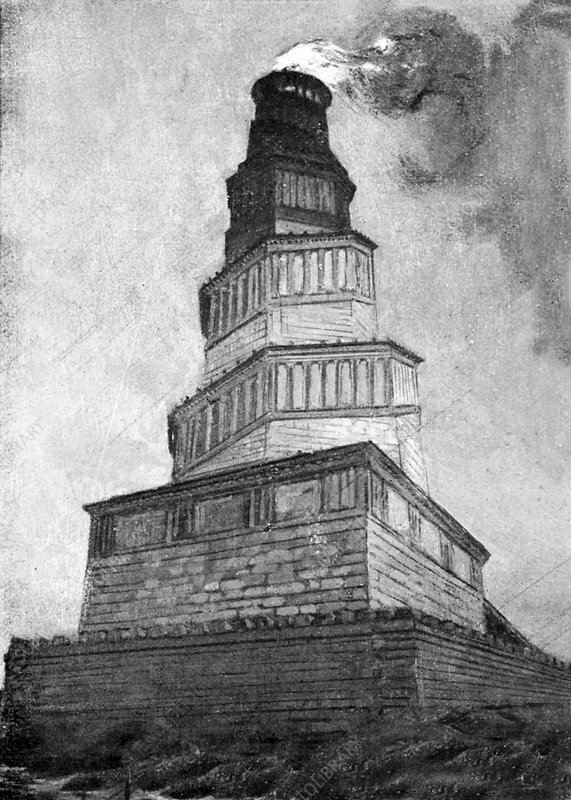 Historical illustration showing the Lighthouse of Alexandria, Egypt. Also known as the Pharos of Ptolemy, this lighthouse was designed by Sostratus of Cnidus and had three sections. Its construction was completed in the reign of Pharaoh Ptolemy Philadelphus between 285 and 247 BC. Fires were used at night, and mirrors in the day, to direct ships. Its height was between 115 and 135 metres, one of the tallest man-made objects of the time, and one of the Seven Wonders of the Ancient World. It was destroyed by several earthquakes in the 14th century. Image from Je Sais Tout magazine, France, December 1909.